This page provides a how-to guide and an introduction to the key concepts of Glow to help instructors get started. The same content is also available as a downloadable pdf file getting-started. You can login to the Glow service at http://glow.williams.edu. You should use your regular Williams username (e.g. abc1) and password. The Dashboard is the first thing you will see when you log into Glow. 1. Global Navigation: The links of the global navigation menu at the top of the page access features that are shared by all the courses on Glow you are enrolled in. This menu stays the same no matter what page you are looking at. 2. Course Navigation: The course navigation links provide access to features within the current course.When each course is first created on Glow, by default it will have fourteen areas linked to in the course navigation (Announcements, Assignments, Discussions, Grades, People, Pages, Files, Syllabus, Outcomes, Quizzes, Modules, Conferences, Collaborations, Settings). As an instructor, you can customize what links are shown in your course and hide from students those that you don’t need in your course. 4. Sidebar (context sensitive): The sidebar shows the features available on the page you are currently looking at. The sidebar will change as you go to different pages within your course. The “Settings” button within the course navigation menu on the left of the screen is where you can view or update the details of your course settings and its sections. You can also configure what will be available to students in the course navigation menu. 1. Course Details: The details of the course, including its name. These should generally be left as the default, although this is also the place to set your course interface to use a non-English language. 2. Sections: You can manage the different sections of your course and their enrollments, and the people associated with your course and their role. It also has a tool that allows you to consolidate enrollments of cross-listed courses into one. Please consult with your Itech Liaison if this is the first time you’re making changes to the sections of a course. 3. Navigation: You can modify the Course Navigation menu listed of your course. You can hide specific links from students, and drag and drop links to change their order. Links that appear to the instructor as greyed out will be hidden to students. 4. Apps: The Apps tab allows you to view and activate a list of additional tools that are available for use in Glow. Additional documentation of these tools will be coming soon. 5. Feature Options: The Feature Options tab allows you to enable and disable Glow features within a particular course. 1. Profile: Where you can change your profile picture (Avatar) and your display name. 2. Notifications: You can configure how you will receive notifications from Glow, e.g. do you want to be notified when a student submits an assignement, how frequently, etc? 3. Files: Files can be uploaded to a specific course, or to your personal file repository where they will be available to use in multiple courses. The files link is where you upload and manage your files in your personal file repository. 4. Settings: You can tie Glow in with other web tools that you already use (e.g. Google Docs, Facebook etc). Click any of the services in “Other Services” for detail. 5. ePortfolios: This is a seldom used tool at Williams. Q: What's my username & password? Your GLOW login ID is your Unix ID (the one *without* @williams.edu), the same username that you use to login to the Password Changer. The password for GLOW is the same one you use for your email and most other College services. You can change your password, and retrieve lost passwords at pchanger.williams.edu. For those who don’t have a Williams User ID but have guest account or temp account on GLOW, your user ID and password will remain the same as it was originally created. For prospective students, you will find your login information in the letter sent to you from the Admission Office. Q: How do I learn to use Glow? Is there an instructor manual? Q: Are there any example courses? A: Yes! Q: How do I add readings, scanned documents, etc. to my course? Q: How do I merge multiple courses (sections) into a single course (section)? Q: How do I upload files? Q: How do I make a link to a website (using a page)? Q: How do I make a link to a website (using a Module)? Q: How can I customize navigation and default language? Q: How do I change a landing page for my course? Q: How do I make my course(s) available to my students? Q: How do I make content available or unavailable to students? Q: I published my course by mistake! How can I hide it again from students? Q: How do I copy course material from one GLOW course to another? Q: How can I view my course as my students do? Q: How do I enroll & remove students, TAs, and auditors from my course? Q: How do I make an Announcement? Q: How do I edit an Announcement? Q: How do I delete an Announcement? Q: How can I get Announcements through my email? Q: How do I add an Assignment? Q: Where can I find the homework my students submitted online? Q: How do I weight the final course grade based on assignment groups? Q: How do I change the date of an Event or Assignment on the Calendar? Q: How do I create a Discussion? Q: How do I pin a Discussion on the Index Page? Q: When would I use Threaded Discussions? Q: How do I set up a graded Discussion? Q: How do I subscribe to a Discussion? Q: How do I set up a Group Discussion? Q: Students aren't able to attach files to their Discussion posts. Help. Q: How can I email my class using Course Email Tool? Q: Where are my personal Files? Q: How do I add a file to my course? Q: How do I bulk upload files? Q: How do I restrict files and folders to students? Q: How do I set usage rights and user access for a course file? Q: How do I set usage rights and user access for a course folder? Q: What are Grades and the Gradebook? Q: How do I hide totals in my students' grade summaries? Q: How do I hide student names in the Gradebook? Q: How do I sort columns my Gradebook? Q: How do I view assignment details in the Gradebook? Q: How do I weight final grades? Q: What is the SpeedGrader and how do I use it? Q: How do I get to SpeedGrader from an Assignment, Quiz, or graded Discussion? Q: How do I leave feedback for my students in SpeedGrader? Q: Which LTI's are currently available through GLOW? Q: Where can I find External Apps to use in my course? Q: I'm trying to access streaming media in Glow, but I see a blank screen. Help. Q: Where are my streaming videos for my course? Q: How do I manage my folders? Q: How do I copy and move media files? Q: How do I use the Panopto Recorder to capture my computer screen? Q: How do I edit my video? Q: How do I add a quiz for a video? Q: What are Modules and how do I create a new one? Q: How do I add items (files, external links, external tools, etc.) to a Module? Q: How do I reorder a Module and Module items? Q: How do I delete a Module and Module items? Q: How do I use Draft State in Modules? ? Q: What are Pages? and how do I create a new one? Q: How do I edit Pages? Q: How do I delete Pages? Q: How do I link to other Pages? Q: How do I create a file link in a Page? Q: How do I upload a PDF to a page in a course? Q: How do I embed a video in a Page? Q: How do I use Draft State in Pages? Q: What are the differences among TA, Grading TA and Grader-Homework? Q: I can't print the Face Book page. Help! Q: What options are available for Quizzes? Q: What types of quiz questions can I create? Q: How do I create and view Survey? Q: How do I create a Question Bank? Q: How do I create a hyperlink? Q: How do I link to a YouTube video? Q: How do I remove formatting copied from another source in the Rich Content Editor? Q: How do I insert a table using the Rich Content Editor? Q: How do I create a new signup sheet? Q: How do I delete and edit openings? Q: How do I sign up others? Q: How do I print a signup list? Q: How do I delete a signup sheet that I created? Q: How do my students sign up for openings? 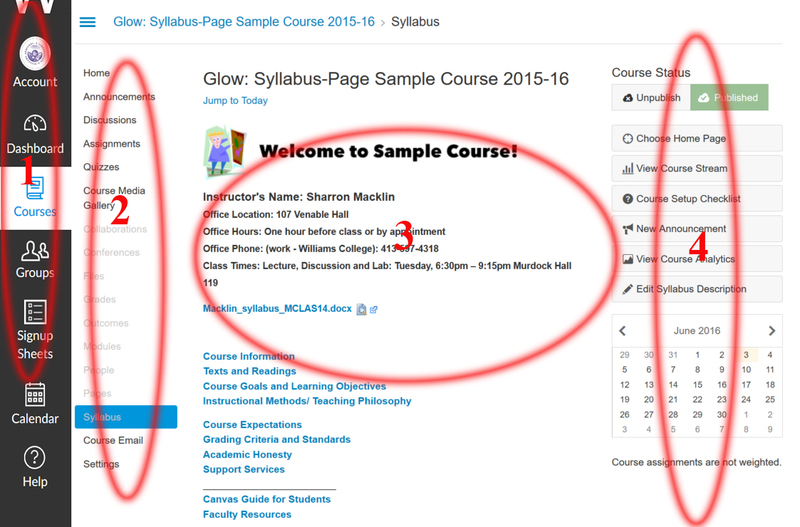 Q: How do I use the Syllabus page? Q: How do I edit the Syllabus description?